A behind-the-scenes peek at the Daily Dose of Greek. 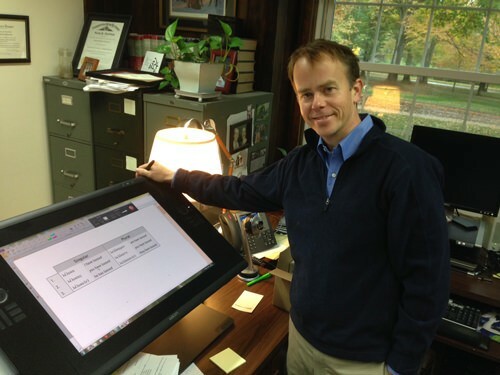 My name is Rob Plummer, and I am a New Testament professor at The Southern Baptist Theological Seminary in Louisville, KY.
For years, I’ve had the joy of seeing students become infected with a holy passion to read the New Testament in the original Greek. Unfortunately, many of those eager students go on to apostatize from the language they once loved. This website is my feeble effort to provide ongoing accountability to busy pastors to read Greek daily and progress in their ability. 1) You can learn Greek “from scratch” or review fundamentals with the twenty-five video lectures posted in the “Learn Greek” section. Lectures are keyed to D. A. Black’s Learn to Read New Testament Greek, 3rd ed. 2) The 2-minute “Daily Dose” video, to which students can subscribe via email. Five days per week, subscribers will be sent a link to 2-minute video in which I talk through a single Greek verse. 3) Under the “Resources” section of the webpage, you will find additional links and resources to aid in learning and using Greek. Please continue to visit this site. We will will always try to add resources in order to help you better read the Bible in the original Koine Greek.